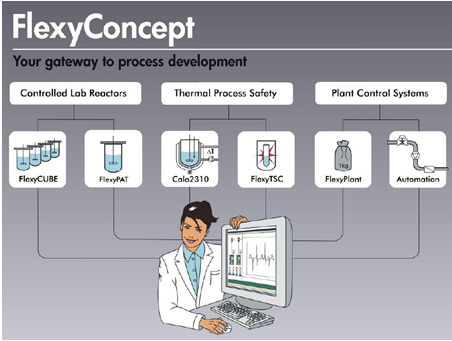 SYSTAG automated lab reactor solutions are available as part of an overall Flexy Concept that governs a range of applications that include Controlled Lab Reactors (CLR), Thermal Process Safety (=TPS) and Plant Control Systems (PCS). All share an overall design philosophy and systems approach that enables interconnection and interoperability. The Flexy Concept provides a flexible and adaptable technology interface architecture that allows automated lab reactor control across an almost limitless range of applications and processes. The Flexy concept is built around two core components, the FlexySys automated technology interface and the SysGraph graphic evaluation tool. The FlexySys controlled reactor software features an intuitive plant synoptic model that provides user-friendly operation without specialist training, menus of predefined operating procedures for simple and safe operations, real time visualization of system status and system parameters, capability to generate editable online charts, along with automatic and continuous documentation. The SysGraph graphic evaluation tool for thermal analysis and reaction calorimetry provides instant access to precise evaluations for safety inspections, allowing intuitive evaluation methods to generate the results and graphs needed for thermal analysis and safety evaluation of substances or chemical reactions. These can be quickly and easily performed on a PC, allowing user to compile informative graphics and save relevant data to a central server. The system can be further tailored with the ThermoGraph module for adiabatic thermal analysis or KaloGraph for evaluation of reaction calorimetric data. SYSTAG’s CLR portfolio encompasses conventional single reactor systems (ALR’s) and multi-reactor applications for parallel process optimization. SYSTAG products in the CLR segment support chemical and pharmaceutical development laboratories by enabling more efficient and practice orientated trials and logging. 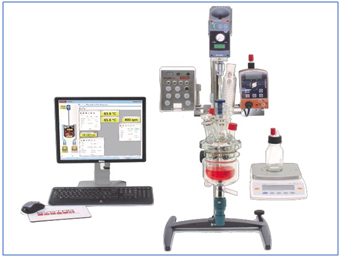 CLR automated lab reactor solutions are complemented by integration of diverse analytical methods (some provided by partners) and special process techniques. The three main automated lab reactor solutions are the FlexyCube and FlexyPAT reactor systems, together with the ePAT multiple reactor control system. FlexyCube allows up to six steel or glass reactors to be independently controlled from a single PC, using parallel design of experiment (DoE) or individual operation. The highly compact design features 70, 100, 250 or 400 ml glass or stainless steel/Hastelloy pressure reactors that are jacketed for full temperature control and equipped for adjustable stirrer speed and torque measurement. The FlexyCube control system allows control via manual operation or programmed recipe with manual intervention possible at all times, data capture and automatic laboratory report, recording of alarms or events, and global support through internet remote access. The system can be optimised through add-on options including pH measurement and control, various stirrer types, automatic distillation with boiling point detection, and isothermal heat flow calorimetry. FlexyCube can operate through temperatures ranging from -80°C to +280°C and up to 100 bar pressures. This makes it ideal for high productivity, accurate experiments, DoE applications and scale-up applications for rapid and high-quality process development. The ScreenX module that allows screening of different reaction conditions allows FlexyCUBE to be applied to drug discovery research, concentration and reaction times studies, optimal reagents and catalysts screening. The CaloX module allows online read out of heat flux in reactions without extra calibration, along with real time decision making to modify the course of experiment based on the measured heat flux. FlexyPAT allows several jacketed reactors to be operated from a single PC as customized turn-key systems, facilitating integration of existing legacy hardware to reduce cost, speed up the automation process and increase user acceptance. The FlexyPAT concept allows simple and inexpensive system extension with user-friendly system configuration through integrated sensor identification. The solution encompassed a wide range of standard functions such as gravimetric or volumetric dosing, temperature control of jacket and reactor, speed and torque stirrer control, pH measurement. It allows manual or recipe control, along with data capture and automatic laboratory reports. Expansion options include automatic distillation with reflux splitter, pressure and vacuum measurement and control, hydrogenation capabilities, isothermal heat flow calorimetry, automatic distillation with boiling point detection, automatic establishment of solubility curves and Isothermal heat flow calorimetry. FlexyPAT can also be integrated with online sensors for turbidity measurement, midIR FTIR, particle size measurement, etc. and can be configured for full GLP and CFR21 part 11 and IQ/OQ. 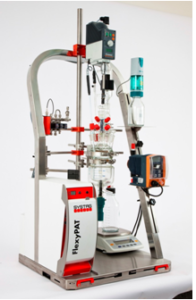 SYSTAG ePAT is a quick, easy and inexpensive way of automating control of double jacketed reactors for research and development. It provides a cost-effective entry route into automation technology, allowing users to optimize their synthesis and processes for both scale-up and scale-down. Combining Plug & Play interconnectability with exceptional ease of operation, SYSTAG ePAT can control an almost unlimited number of jacketed reactors in the chemical laboratory, allowing integration of a wide array of laboratory devices. EPAT’s integral safety concept provides uninterrupted 24/7 monitoring, allowing unsupervised operation, while the integrated eController feature handles all regulation and protocol tasks system, eliminating need for a conventional computer-based control system. The ePAT Starter Kit includes FlexySys application software for controlling one reactor, monitor with backpack eController, US keyboard, and mouse, universal I/O module for connecting analog sensors/ actuators, cable set for connecting sensors and actuators, the ePAT interface and manual operation. The intuitive Fconnect interface allows Plug & Play set up with easy integration of all common laboratory equipment (including Huber, Julabo and Lauda thermostats, Sartorius or Mettler-Toledo laboratory balances, Metrohm Dosino volumetric dosing devices, Heidolph or IKA stirrer motors and additional peripherals). The basic ePAT configuration offers a wide range of functions for performing routine tasks such as tempering, dosing, stirring, or adjusting pH with greater reliability and reproducibility. ePAT can be further adapted to individual user needs with a range of options that include pressure, vacuum and venting control, third dosages and volumetric dosing. As an integral component of FlexySys, ePAT can be upgraded to full FlexyPAT specification, complete with integrated recipe control and other customized functions. 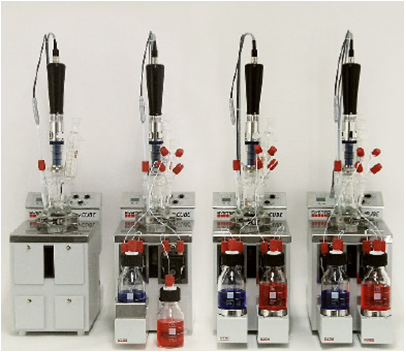 Click on SYSTAG automated lab reactor solutions for other information.